I am all right again. Yesterday morning I had an early call to come to see Dr Rixey. He is very sick—A In the early afternoon I went to bed and stayed there until this morning. Telegraph me if you wish me to put some money in the American & Security Trust Company. The statement shows you have $160.00 there. I am engaging a state room for you from Boston to Rochester leaving next night at 4 PM. seven from the South Station—I have a feeling that I am not going to be able to make it—but I am hoping for the best. I had a nice talk with Arthur Hellen to-day about your contract with him etc—also saw George Harrison and again thanked him for his kindness in the matter. The heat has been the worse of the summer but it is raining to-night, so hope for cooler weather to-morrow. There is great anxiety about Mrs. Harding. I seriously hope she will recover.Mrs McLean returned from Bar Harbor in a special train. 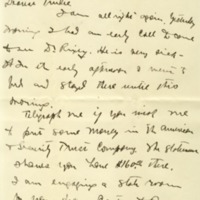 Grayson, Cary T. (Cary Travers), 1878-1938, “Cary T. Grayson to Alice Gertrude Gordon Grayson,” 1922 September 26, WWP16450, Cary T. Grayson Papers, Woodrow Wilson Presidential Library & Museum, Staunton, Virginia.